Everyone needs from time to time a chance to kick back, unwind and relieve themselves of the stresses of day to day lives. Sometimes though this doesn’t happen when one stays at home – things crop up and you end up spending your downtime being so busy you don’t end up feeling relaxed by the time you are due to head back to the grind. To that end we have a fantastic trip guaranteed to relax and revive. A dash of humour starts off our little getaway as we depart on a four day comedy cruise from Sydney to Auckland. We follow this up with some pure indulgence in New Zealand itself, first sampling some of the famed New Zealand Wines, then taking off to Rotorua for a Traditional Maori Cultural experience and a fantastic spa package at Hells Gate – Massage, facial, thermal walk, mud soak and spa. Comedy, Wine and Spa – What more is needed to truly relax! 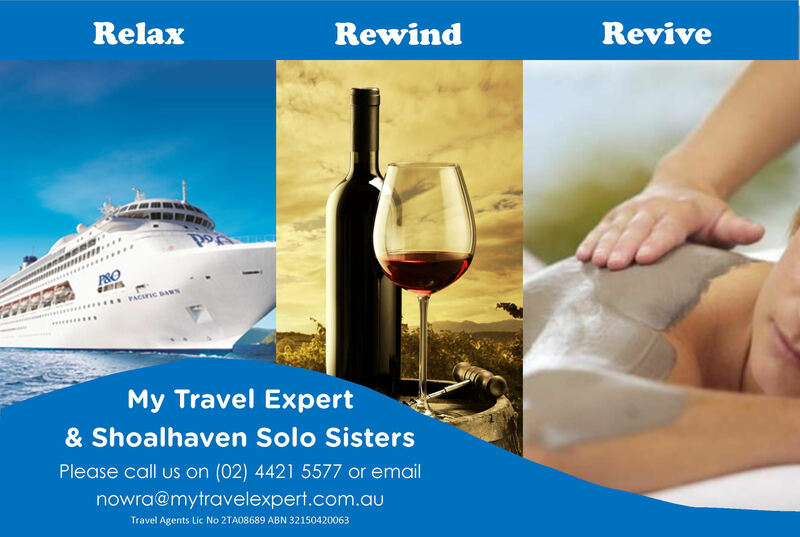 Posted on May 16, 2014, in About, Events, Experience, Expressions of Interest, Promotions, Tours, Uncategorized and tagged auckland, comedy cruise, facial, massage, mud bath, my travel expert, relax, revive, rewind, rotorua, Shoalhaven Solo Sisters, spa package, wine tour. Bookmark the permalink. Leave a comment.